Doesn’t the NFL Want Gay Players? RUSH: Manti Te’o. 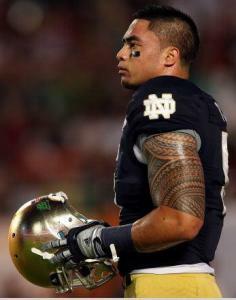 Manti Te’o is the Notre Dame linebacker who had the fake girlfriend for how many years? A year or two years, he had a fake girlfriend. They’re having the NFL combine in Indianapolis. This is the meat market. This is where the prospective players show up and they’re put through their paces and physical workouts. Management personnel and scouts from all the NFL teams are there to observe, clock, time, examine, give tests to and all this to determine whether or not these guys are fit to be in the NFL. They even set up… Never mind. I won’t go there. As humorless as people are… You would not believe it. I got the audio sound bite roster today. They’re still talking about my observation, “I’m ashamed of my country,” and the people talking about it — Juan Williams and Mary Katharine Ham at Fox — apparently didn’t even understand what I meant by it! They think I’m really ashamed to be an American, that I’m ashamed of the country as it is. I don’t know how, folks. I literally don’t know. I am perhaps one of the best communicators in American media and have been for years, and I don’t know how they think this. This is why I’m not gonna do my little NFL combine joke. Nobody’s got a sense of humor out there anywhere. They wouldn’t understand it. They wouldn’t find it funny. They’d be offended by it. They wouldn’t laugh at it, wouldn’t get it. If even people on our side are not gonna understand what I mean or meant — and I was perfectly clear, by the way. What we are being subjected to by our government makes me ashamed. Not the Constitution, not the country, not the way we’re founded! The current government and the way it’s dealing with us makes me ashamed. We’re having our intelligence insulted every day. FLORIO: Here’s the elephant in the room for the team — and it shouldn’t matter, but we have to step aside from the rest of reality and walk into the unique industry that is the NFL. Teams want to know whether or not Manti Te’o is gay. They just want to know. They want to know because in an NFL locker room, it’s a different world; it shouldn’t be that way. FLORIO: It’s just that they want to know what they’re getting. They want to know what issues they may be dealing with down the road. We just assumed that, at some point, there would be an openly gay player in an NFL locker room and the team would have to work with the realities and make sure that everything’s fine. Now you’ve got a situation where you have a guy who was in a relationship with a fake girl who ended up being a real man, and the man has said to Dr. Phil that he was romantically in love with Manti Te’o. It just creates a lot of questions that the NFL, at some point, is gonna have to deal with. RUSH: What’s so strange about all that? There’s nothing odd about all that. It seems perfectly normal to me: A fake girlfriend was in love with a guy who he’s pretending to be the fake girlfriend to who’s wanting to play in the NFL. What’s the problem? RUSH: You know what’s got me confused about all this is I thought the NFL was okay with gay players. I thought they wanted gay players, at least some of the teams, like the Ravens. Maybe not the Niners, but I thought the Ravens did. They have a player there that’s pro gay marriage. You can’t have gay marriage without somebody involved being gay. But it was Mike Florio of Pro Football Talk. It’s one of the best NFL websites out there, by the way, Pro Football Talk. Florio said, “You have a guy who was in a relationship with a fake girl who ended up being a real man.” That’s the Tuiasosopo character, and the man, Tuiasosopo, “said to Dr. Phil that he was in love with Manti Te’o.” So that’s quite a circumstance there, and Florio says, “It creates a lot of questions the NFL, at some point is gonna have to deal with.” They want to know who they’re dealing with here. COURIC: One of the theories — many theories, Manti, making the rounds — is somehow you created this whole scenario to cover up your sexual orientation. RUSH: “Faaaar from that,” and they all laugh. Not that there’s anything wrong with being gay, of course. But he’s “far from it.” So he’s already answered the question. The NFL is clearly not satisfied. The gay people I know, just talking about performance, are really quick on their feet. So I don’t know what the NFL’s concern here would be. As I say, I’ve been under the impression that everybody knows this is a fait accompli anyway. I told you this stuff was gonna happen.